If you are a student of computer science and plan to take a course related to data security, then this article will be of particular interest of yours; because sooner or later you will have to implement RSA either in its trivial or more sophisticated form. Before I present the code of its implementation let me propound how UI of this implementation has been designed. Create p: The program will create a random prime number of 512 bits, almost 150 digits. Create q: The program will create another random prime number of the same size as p.
n = p x q: The program will calculate n = p x q. (p – 1) x (q – 1): The program will calculate Φ(n) = (p – 1) x (q – 1). Select d: Since d is the private key, we’ll select that of our own choice and then based upon that we’ll calculate e. The formula for calculating d is coming in short. Calculate e: This is the last step in key generation. The formula of calculating e is coming in short. Up till this step, our RSA key has been generated, now we are ready to enter plain text and apply encryption algorithms. After entering plain text, click on Call (OAEP) button to apply padding. Encrypt: The program will encrypt the number produced by OAEP routine. Decrypt: For verification that Encryption and Decryption routines are inverse of each other and that cipher text can be converted back to plain text, you can click on Decrypt button and you’ll see a congratulations message (hopefully, if everything goes alright). Following is the window that you will see when you’ll run the java application. Up till that step your encryption is done, now to verify that encryption and decryption work inversely we need to click Decrypt button and get the following screen. // Encrypt the plain text entered. // CAUTION: Plain text should only be numeric and should not be a value bigger than 10 - 15 digits. // Decrypt the encrypted integer back to prove that encryption and decryption are inverse of each other. that encryption and decryption are inverse of each other. 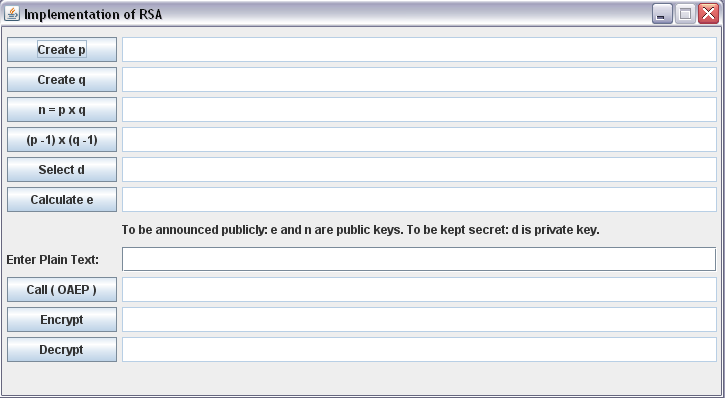 private JLabel lblAnnouncePrivatePublicKeys = new JLabel("To be announced publicly: e and n are public keys. In btnDecrypt_Click() you are using p1Length which is calculated in the encryption phase. How do you calculate that if you don’t know the plain text? I could go back and study and answer your question, but frankly speaking I’m crazy busy these days, therefore, I encourage you to put some of your own effort and find out. Perhaps the application that is creating cipher code could pass P1Length as a parameter to the other application which is deciphering. Lastly, OAEP is not an essential part of RSA, you can skip OAEP and still implement RSA. Good luck! I will try to find it out but I am unfortunately not an expert on this. WOooow! That’s great man:) Thanks alot for your link. You are very welcome, I hope it helps. Its Realy nice and Great Work for the End users,new commer in programming.